An announcement regarding DoorDash order services. Made Pho You is not affiliated with this third party delivery service provider. We are unaware being listed on their platform to process orders on our behalf. Our menu listed on their platform is incorrect and not up to date. Made Pho You is not responsible for orders taken through or by Doordash. We apologize for any stress this has caused our customers. This vermicelli dish is literally love in a bowl. It is a dish that pits together a mixture of tastes and texture including sweet and sour, fresh herbs, crunchy spring rolls and grilled meats ranging from beef, chicken, and shrimp. 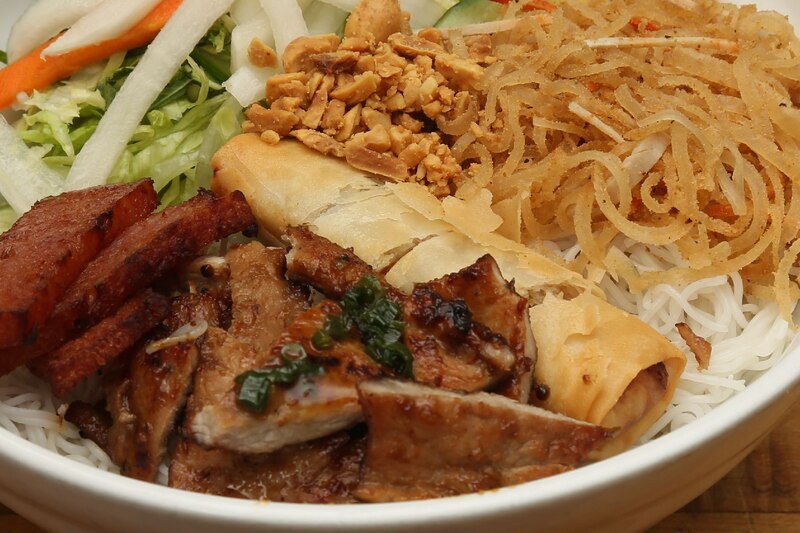 What sets our menu apart is the fact that our customers can choose how they want their vermicelli bowls. It is one of our most popular items. This delicious delicacy is made with grilled meats layered on top of vermicelli noodles over a bed of greens, pickled vegetables and topped with fresh herbs and bean sprouts. You also have a variety of choices to add extra menu items such as spring rolls, fried sausages and grilled shrimp. Served with roasted peanuts on top and a small bowl of fish sauce.